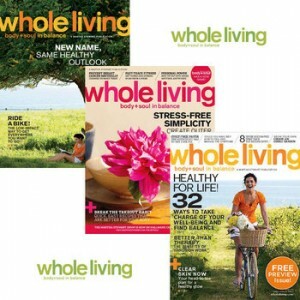 Whole Living Magazine Subscription - Only $3.50 Through 10/4 | A Savings WOW! Here’s a great deal on Tanga for a 1-year subscription to Whole Living magazine (10 issues). Normally, $14.99 per year, you can get a subscription for only $3.50 per year when you use the coupon code LIVING at checkout through October 4th at 8:59 PM CST. Whole Living, formerly New Age Journal, is one of America’ most respected magazines covering holistic living. Each issue includes an exciting and thoughtful mix of features, columns, and departments that help readers explore new discoveries in natural healing. Order your Whole Living magazine subscription for only $3.50 today!